**Products Provided** Hey everyone! It's almost summer and Memorial Day (which is my Bday :)! Barbecue is getting ready and the beaches are filled. 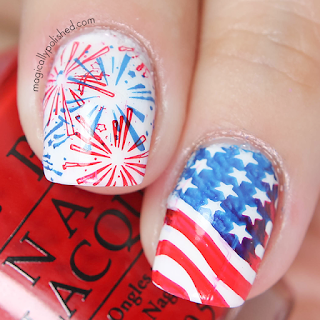 I'm guessing many of you won't have the time to create some summery or patriotic nails. 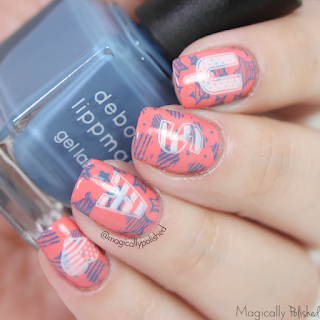 This is the reason why I fallen in love with stamping lately. 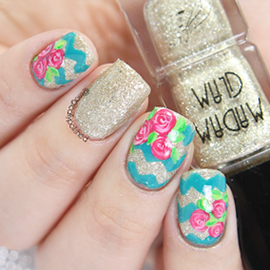 It's quick nail art fix. 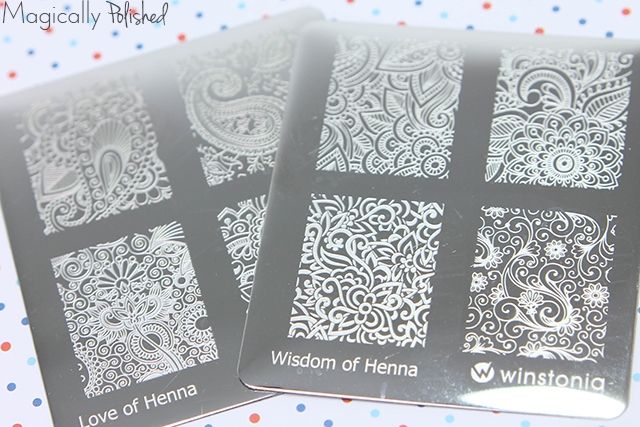 So for today's post I reviewed some fantastic products from Winstonia.com. 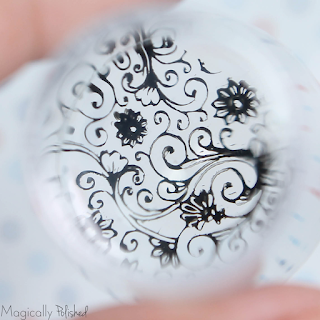 The clear stamper I received has to be one of my top favorite stampers to use. 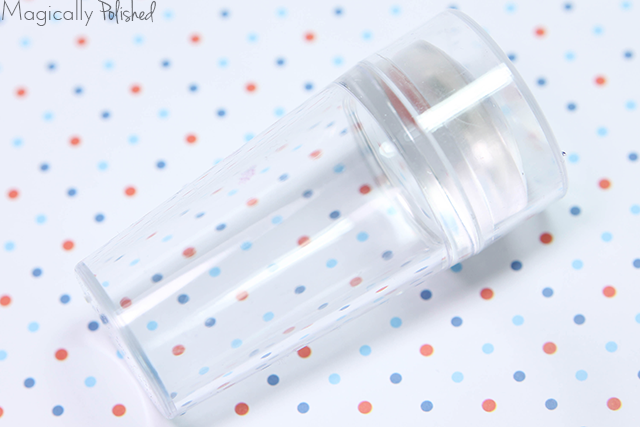 It is a true clear stamper. I didn't need to prime it and it picked up the image perfectly. It definitely stamped clearly the first time. You will also have very clear view down the barrel of the stamper, which made it a lot easier to to place my image exactly where I wanted it. I even loved how tough and easy it was to use the clear scraper, thumbs up! Getting ready for Memorial Day, Foruth of July and Veteran's Day, is really difficult to come up with designs at times. 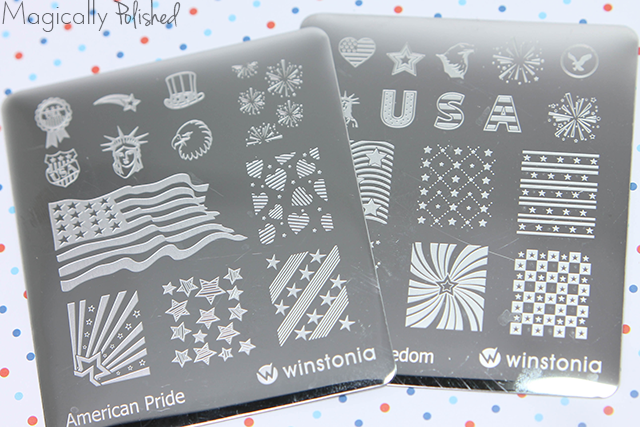 So this is the perfect stamping plate images to use for a fast and quick design. For this look, I wanted to create something less traditional, more or a less the colors. I first applied one coat of Deborah Lippmann Happy Days. 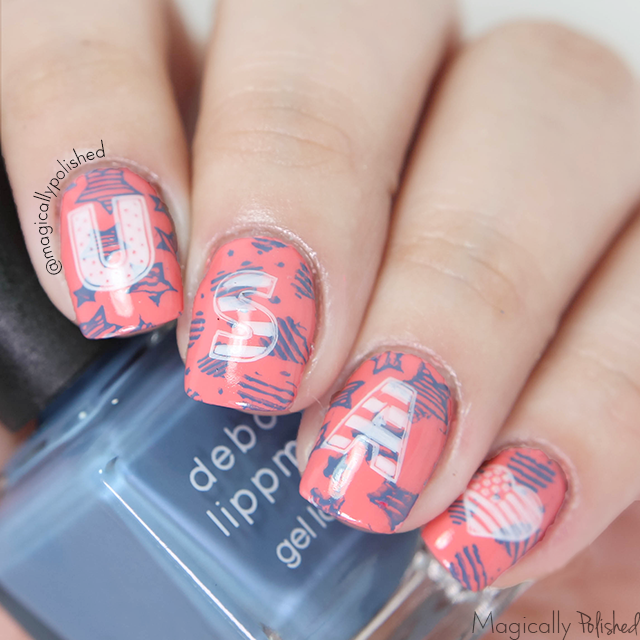 Once completely dried, I then used Deborah Lippmann My Boyfriend's Back over the heart and stars stamping print and stamped it over each nail with the clear stamper. 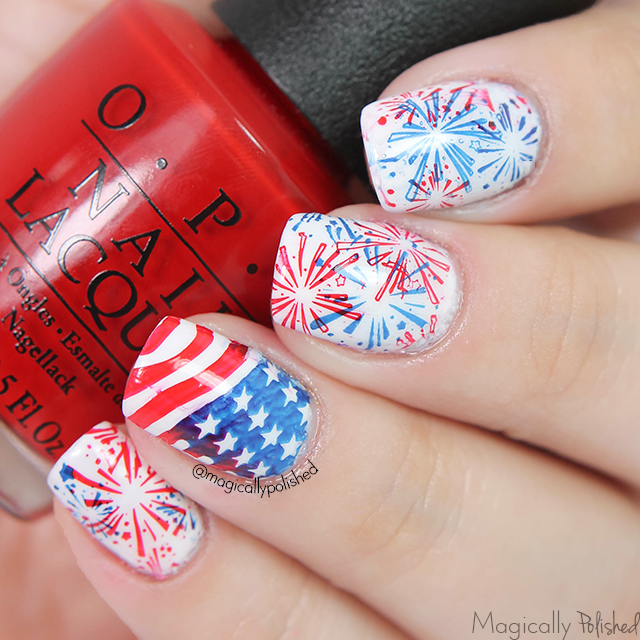 To complete the patriotic look, I stamped each "USA" letters and heart flag with white stamping polish. I lastly sealed the design with top coat. 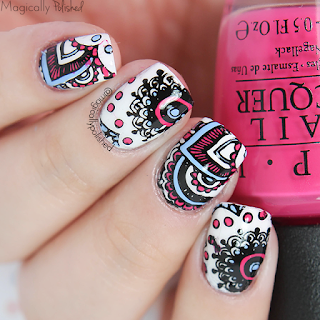 Now since I didn't go for the traditional colors on the first mani, I then decided to go for it for this design. First I applied two coats of OPI Alpine Snow for the base. Once completely dried I applied OPI Having a Big Head Day and Essie Catch of the Day over the American Flag and added it onto the ring finger. 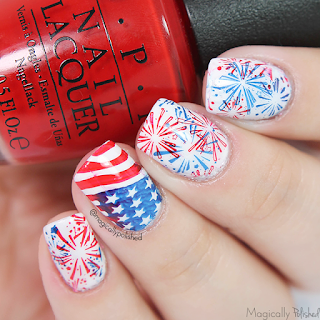 Using the same polishes for the fireworks. Lastly I sealed the design with top coat. 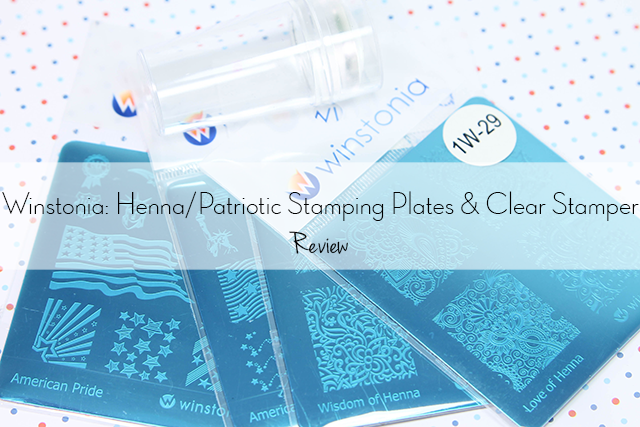 Is a really cute and fun stamping plate with palsy and floral designs. 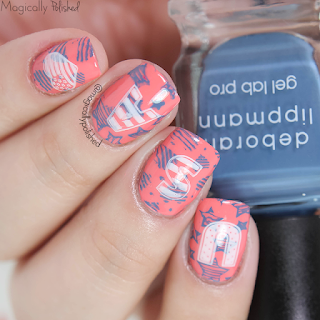 Each had four different designs, perfect for tons of nail art ideas. For this look I really wanted to create something girly and cute for the summer. First I applied two coats of OPI Alpine Snow for the base. 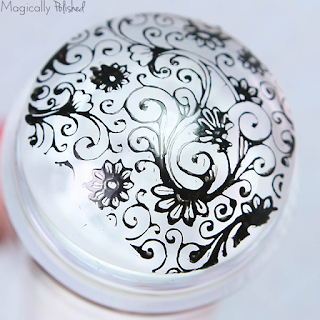 Once completely dried I then stamped the design from Love of Henna using black stamping polish. As that was set I added OPI Mad for Madness Sake and The I's Have It on the clear stamper and then stamped them difrrectky on each nail. Lastly I sealed the designs with top coat. 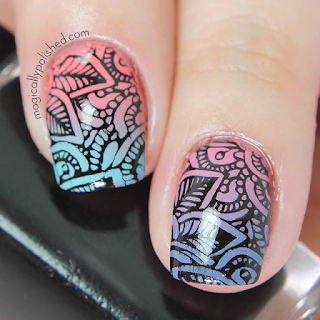 For this look I wanted to create a gradient and use one of the henna designs from Wisdom of Henna stamping plate. Fo the base I applied one coat Deborah Lippmann Happy Days and Beauty School Dropout. Once completely dried I sponged the base using Deborah Lippmann Splish Splash over Happy Days and My Boyfriend's Back over Beauty School Dropout. I then stamped the floral designs on the nails and sealed them with top coat. I love this look! Overall the plates are all beautiful and wonderful to work with. Every image were just perfect and transfer nice and crisp. I would definitely recommend these to anyone! Each are sold separately at winstonia.com for $4.95 each. You can use my coupon code: MAGIC for 10% off.